Loewen Cyprium features copper and bronze clad windows and doors that are unique in design and construction. The Cyprium collection is artisanal in detail, down to the soldered exterior joints and rich, tactile depth of texture in the thick metal cladding and deep profiles. These hand-wrought living surfaces develop distinctive patinas that adopt and define the individual aesthetic character of the homes to which they belong. 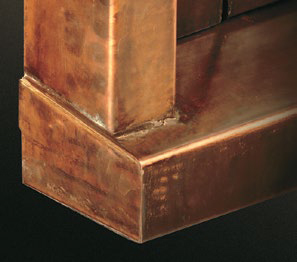 Lead-free soldered joints add a hand- forged, authentic appearance that is both attractive and functional. Soldered joints create a cohesive, watertight body for frame and sash members resulting in uniform reaction to temperature fluctuation. 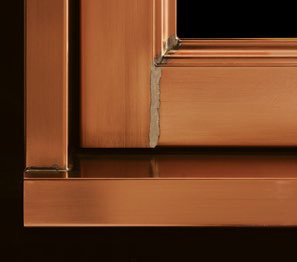 Recessed from the face of the sill and frame, this classical mullion detail adds visual harmony. Cyprium deep sills are well suited to masonry wall construction. Hand-fitted sill caps are soldered in place for structural integrity and a finished appearance. 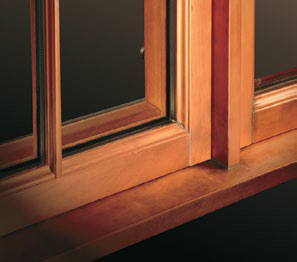 Picture/Direct Set (fixed, non- sashed units) offer an even deeper offset from the face of sill, head and frame members to the vertical plane of the glass.